Encourage guests to dress in jeans—what else—and t-shirts in primary colors. Primary colors—especially construction sign yellow—reinforce the building blocks theme, as do block shapes. Choose squares for paper plates, for example. You’ll find lots of choices online or at party stores. Let blocks, building brick constructions or construction vehicles take center stage a table decor. 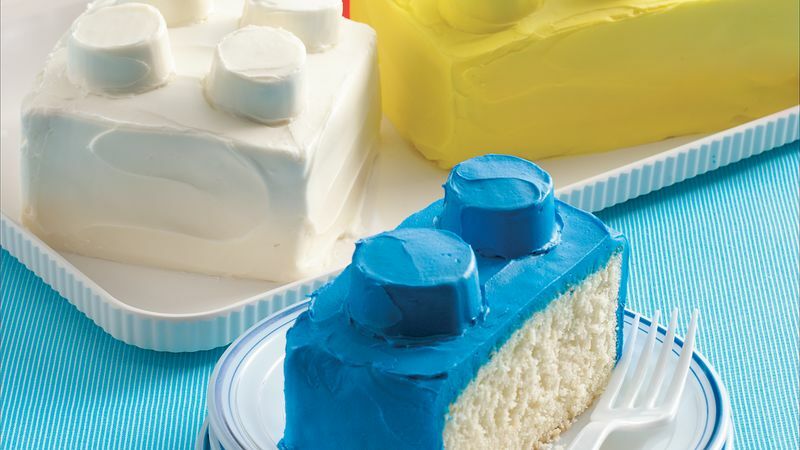 Have plenty of blocks and building bricks for partygoers to play with as guests arrive! Depending on age of children, have them construct table decorations individually or together. Inspire older children with construction activities found online like those at the Lego® website. Use blocks to create contests—tallest stack, best construction made while blindfolded, fastest specific construction while wearing construction gloves. You get it! Fill toy trucks with Load 'n Go Gorp as shown to serve at party or as take-home treats. Make and decorate easy cutout cookies using construction-themed cutters, like hammers, saws, screwdrivers, and package for take-home treats. Use easy Betty Crocker® sugar cookie mix and a recipe like Confetti Christmas Cutout Cookies for inspiration.